Jicama is good raw in salads, but it's also great roasted. I cut it into chips and roasted it in the oven for use as the nachos in this recipe. 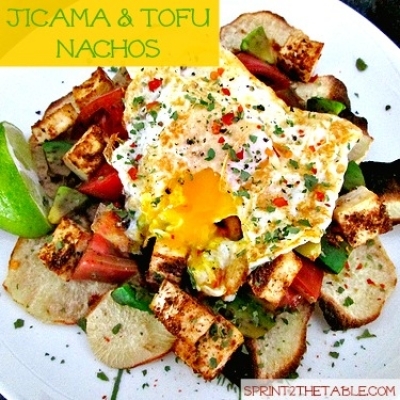 Place the thinly sliced jicama on half of a parchment-lined baking sheet. Season cubed tofu with your favorite Mexican spices and place on the other half of the baking sheet. Cook both under broil for 10 mins, flipping half way through. Make sure you watch the jicama closely so as not to burn it. While that is roasting, cut your tomato and avocado into cubes. Set aside. When the chips and tofu are done, remove from the oven. Arrange chips in nacho-form on the baking sheet. Top with tofu, tomato, and avocado. Place the pan back in the oven under the broiler for ~5 mins, until warmed through. Meanwhile, cook egg to desired level of doneness on the stove top. Remove chips from over and verrrry carefully slide off onto a plate. Top with the egg (if using) and garnish as desired.